Blogger does not allow you to publish your Blogger blog at naked domain name, i.e. domain name without www. But you can set up a redirect from naked domain to www-domain name. A number of visitors who like your content generally try to access your blog by directly typing your blog's url into their address, direct traffic for short. But with no redirection set up your direct traffic will instead get a 404 (page not found) error. Navigate to 'Settings' > 'Basic'. Check the box that says "Redirect yourdomain.com to www.yourdomain.com". Login into your domain provider account. (here, Godaddy). From 'My Account' launch your domains. A list of all the domains you own will open up. Check the one associated with your Blogger blog. From the menu tab located just above the list. Select 'Forward' > 'Forward Domain'. Select 'http://' from the drop-down menu. And enter your domain with www in the next field. Leave the 'Update my DNS settings to support this change' box checked. If not checked already do check it. Or else your DNS won't get updated automatically. 'Advance Options' are also available but no need to deal with them. They are set to permanent forwarding. Changes will become effective in a time range of 30 minutes to 48 hours. Generally it takes less than 30 minutes. Refresh or reload your blog with naked or non-www domain. 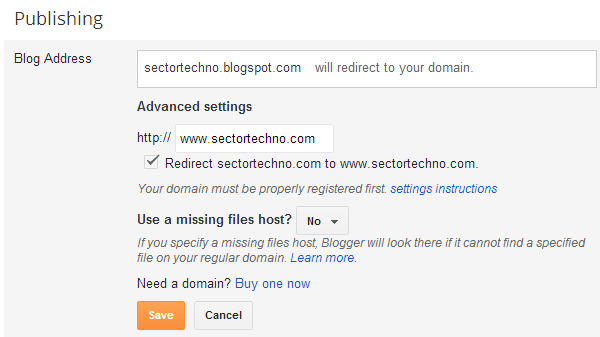 It will now get automatically redirected to your blog's url. Hi Shukla, do you mean to say you can redirect non www to www (just like 301 redirect) by using this trick alone? Well, you dont require to do anything other than what is mentioned above. Redirects are applied automatically. This is not a trick but a feature provided by Blogger. It will automatically apply 301 redirect from naked domain to www-domain. You can check redirection type on redirectcheck[dot]com. from my blogger account, Settings' > 'Basic doesn't show this option to redirect. is there any alternative way for this? First, put your custom domain name in the field provided, and save it. Then the option will open up. Try, accessing your blog with both www and non-www version of your domain. Why Alexa Ranks Facebook above Google?